In 1939 a young Isabel Crook visited Hanyuan County with plans to carry out an anthropological study of a Yi village in the area. Isabel later went on to become a renowned social anthropologist and, along with her husband David, wrote a number of influential books on Chinese society such as "Revolution in a Chinese Village: Ten Mile Inn" (Routledge 1959 ISBN 0710033931). Isabel and David still live in Beijing. 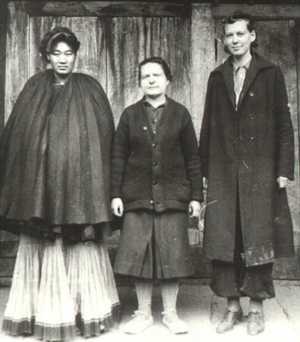 (Right to left) Isabel Brown (Crook), aged 23; Emma Broadbeck and the Black Yi princess. "I set out in March 1939, from Ya'an to travel through Yi territory with an American missionary Emma Broadbeck who was familiar with the area. We walked across the mountain pass and came down in Hanyuan County where we stayed in the local school compound, then on to Fulin [the county town where DORS office is based]. We visited Zhaohoumiao, which Emma knew and it was through her that I met clan leader Li in Zhaohoumiao and was invited to return and stay in his village." At that time the Yi were a slave-owning people. Clans would gather around a headman or family and accumulate status through ownership of slaves, who (according to Han Chinese history) were often captured on raids into other areas. In Zhaohoumiao in 1939, one headman (touni), with his five brothers acting as deputies, controlled a large area on the east bank of the Dadu River, including the mountain villages above. This area corresponds to present-day Shunhe Township and comprises six villages, including Juetuo, Banyang and Na'er where DORS is implementing projects. According to old people in Zhaohoumiao today, at that time all young men came to Zhaohoumiao to serve under the village head. In those days there was a much larger population of between 250 to 300 people in the hamlet. Li Guangdou [a.k.a. 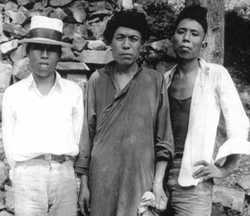 Li Mingao] (centre) the village head of Zhaohoumiao in 1939, stands with two of his brothers, Li Mincai and Li Minfeng (right). The village head and his family owned all of the land in this area. The people under his jurisdiction worked the land, as did slaves who also tended animals and looked after the family's children. It appears from Isabel's observations of the village that most of Li Guangdou's family owned slaves. The picture on the right shows Li Mincai's wife, aged 27 with one of the slave girls from the village head's household. The girl whose name, Qiya, probably just means seventh slave girl, was thirteen and her task was to look after goats. 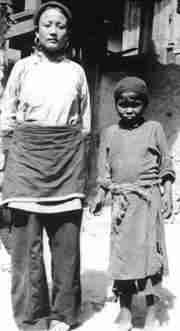 Isabel also noted that the women from the village head's family wore trousers whilst slave girls and women wore skirts (as can be seen in the photo). Most of the slaves in Zhaohoumiao were from the southern and western side of the Dadu River. 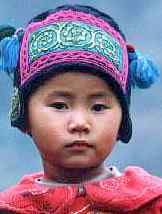 Whilst the Yi people no longer keep slaves, the task of goat herding, leading the animals up the mountain every morning, watching where they feed to ensure they do not stray onto crops and calling them home in the evening, still falls to young and teenage girls or occasionally the elderly. Today, Zhaohoumiao, as Banyang Village Hamlet 3 is administered by Shunhe Township. The township is the lowest level of China's centralised system administration, with both a township leader and a Party secretary overlooking the affairs of its villages. In each village we also work with Party secretaries and village leaders, and also sometimes the women's officer or accountant. Each hamlet has its own hamlet leader who deals with day-to-day issues and represents the hamlet at village level meetings. Zhaohoumiao, unlike many of the villages in the southern part of Hanyuan County, has paddy land, irrigated by a stream flowing down from the mountains above and then into irrigation works which the village first built themselves in the 1930s. During Isabel's stay in the summer of 1939, she took photos of people ploughing the paddy fields with water buffalo. At that time, the village head and his family owned all the land. 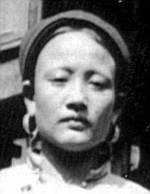 One of the women DORS spoke to about the village history remembers her father talking of working on Li Guangdou's land. As today, women also worked the land. Unlike the Han in those days, it was not the Yi practice to bind the feet of women. Then and now - the same paddy field, photographed by Isabel Crook during ploughing in the summer of 1939 and below, nearly sixty years later in December 1998 growing the winter crop of wheat. During the 1960's and 70's, as throughout rural China, Zhaohoumiao's land was farmed communally. This period brings back bitter memories for the older people of the village. Grain was distributed from the commune and rationed within the village. 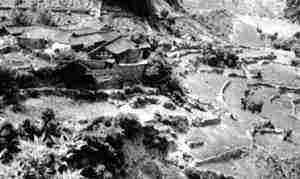 Everybody in the village ate very little at this time and many died from starvation or disease. 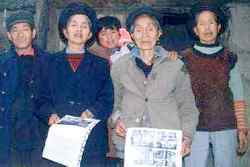 Those who had been rulers of Zhaohoumiao when Isabel visited were not exempt, and according to the older women of Zhaohoumiao today, Mrs. Li Mincai (right) was one of those who died. She had no children. Following the agricultural reforms of the early 1980s, the land was distributed to families and is 'leased' on a 30-year basis. Arable land cannot be sold and even redistribution of land within families must get the approval of the township government, who have responsibility for administering the allocation of land. Today seasonal crops of rice and winter wheat are grown on the paddy land whilst upland slopes are used for growing maize. In 1939 the village most likely grew rice supplemented by buckwheat as the major crop in the mountain fields. At that time opium use and addiction was endemic throughout China, although Isabel remembers none being grown in Zhaohoumiao. South of the Dadu River, opium fields were a common feature of the landscape. The nearby city of Ya'an was a local opium distribution centre and opium made its way there through Hanyuan County. Opium was used in the village, certainly by the powerful. Some of the older people in the village today were aware that opium use went on in the village then. When Isabel Crook stayed in Zhaohoumiao it was in the house of the village head. This came to be used as a school during the collective era. Today there is no school in the village so children attend school about two kilometres away at the government offices in Shunhe Township, the same location where there was a Baptist mission school in the 1930s, though these days the children can walk there along the recently built main road. Since the reforms of 1978 in rural China, the bulk of the costs of rural education are passed down to the village and the family. A number of families can't afford to send their children to school. DORS has been supporting the poorest families in Zhaohoumiao by paying school fees since February 1997. Education was obviously important to the village head. He had supported the establishment of the mission school. Li Mincai (one of the brothers of the village head, pictured above wearing a hat) was studying in a teaching school across the river in Tianba town at the time of Isabel's visit. Li Guangdou's eldest son was studying at a school in Fulin. Traditionally the Yi follow what is described as an animistic faith - one that attributes a living soul to plants, inanimate objects, and natural phenomena. 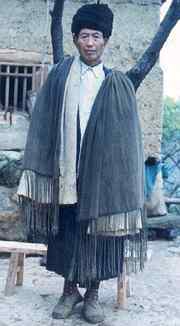 They also use shamans known as bimou - normally men who are said to have special powers or be in communication with the spirits. Whilst in Zhaohoumiao, Isabel met bimou Liu who was from Tianba town and who she described in her notes of the time as the "right hand man" of village leader Li Guangdou. On her way to Zhaohoumiao Isabel had passed through Tianba and witnessed bimou Liu hypnotise a man who then "licked a sizzling hot shovel". 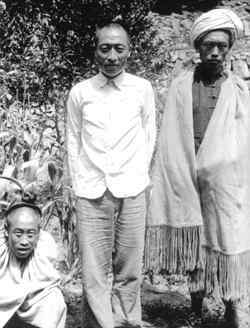 Bimou Liu (centre) with two other men from Tianba who are both wearing the tasselled felt capes still worn by Yi people in Hanyuan today. The people of the village today, whilst slightly embarrassed to talk about a subject that is officially described as "superstitious", did tell us that there are still shamans and that they still use them. During DORS visits to various Yi villages in Hanyuan County we have seen interesting straw figures and effigies. It appears that shamans also play a role in traditional healing rites. In nearby Juetuo Village, Rose witnessed a ceremony to bless the people of the hamlet and protect them from natural disasters such as soil erosion, drought, and storms. The ceremony called for the villagers to gather together in a special location, the bimou then made offerings of maize and incense, and sorghum wine. The villagers had all brought a contribution. Some water from the Dadu River was mixed with tea and sorghum wine in a bowl and the bimou walked around the people chanting and carrying the bowl. Then he chanted for half an hour next to the group whilst flicking the mixture from the bowl with a sprig of a local fragrant bush called 'xiang guan'. After the offerings were made the villagers could drink some of the blessed wine. This ceremony is preformed every year on the third day of the third agricultural month. Unlike other Yi villages in Hanyuan, the people of Zhaohoumiao bury their dead and appear to have done so for some time. In other villages, such as Sugu in the south of the county, there will be a sacred grove of trees that cannot be cut down except to supply the fuelwood for use in cremation. During the ceremony an altar is built amongst the trees, upon which the deceased is cremated. The grave on the right here pictured by Isabel still remains sixty years later (left). Since 1939 China has undergone tremendous changes. One of the biggest changes to affect Hanyuan must be the improved transport links. Whilst still a remote area, Hanyuan County now has a railway station on the Kunming to Chengdu line, along which passes a slow train that stops at a number of small stations in the counties of the Liangshan Yi Minority Autonomous Prefecture south of the Dadu River. This has affected Zhaohoumiao, where a new concrete road that passes through the village has been built to link the station at Wusihe with Fulin, Hanyuan's county town. For the current village leader this is very convenient, as he owns a truck and can use this to earn a living. According to Isabel, when she first travelled to Zhaohoumiao from Fulin there was just a winding path following the river. The village now has electricity that provides lighting and powers some grain threshing and grinding machinery used in the village. This is communally used but run by one family who manage the machines. 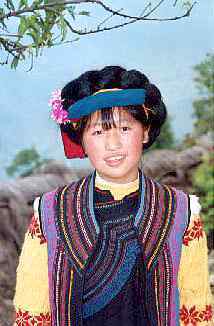 The Yi people have colourful and beautifully embroidered traditional clothing. However, much of this is reserved for wear on special occasions such as for weddings and in some cases festivals. These days the only elements of traditional costume commonly seen worn by the Yi people of Hanyuan County are the man's cape [left - Yi man in Zhushan Village], the waistcoat and the square headpiece worn by women [both waistcoat and hair-wrap over square headpiece can be seen on this young woman, also from Zhushan,]. It seems that then as now the people of Zhaohoumiao wear contemporary clothes in their everyday life with jeans and suits fashionable amongst men and women. 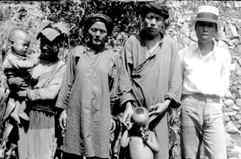 (Right to left) Li Mingcai, the headman Li Guangdou, with his second son Muli aged 4, his wife and an anonymous slave holding Moga, Li Guangdou's third son, aged 1. 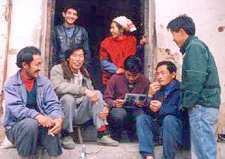 Whilst asking villagers about the photographs in December 1998 DORS met Li Jun who identified the headman as his grandfather and young Moga in this photograph as his late father. Far right shows a group of today's residents puzzling over the photos of their village taken sixty years ago. Many people, whilst not remembering the faces in the pictures knew of the people once they recognised the names Isabel had recorded. What has happened in Zhaohemiao since Isabel's visit? During DORS visit to Zhaohoumiao in 1998 we discovered what became of the Li family after Isabel Crook stayed with them in 1939. Two years after her visit, the village was attacked by another clan who came over the mountain from what is now Matuo Township. A huge battle took place within the village and as many as seventy of the village men were killed by the intruders. The village was set ablaze and many of the wooden buildings were destroyed. The villagers were forced to flee across the river to seek reinforcements from Tianba (home of the shaman) before they could repel the intruders. The battle was a major event in the village's history and some of the old people who we interviewed (seen left looking at Isabel's photos) who would have been children at the time and remember it clearly, some still harbouring bitter memories. In 1949 the Communist Party established the People's Republic of China and began reshaping Chinese society. Gone were slave-owning clan leaders and warlords. For Zhaohoumiao, this time seems to have been filled with conflicts. Li Guangdou (left) the headman at the time of Isabel's visit died as a result of his opium use before 1949. He was succeeded by his brother Li Minyang, who was imprisoned by the authorities for ten years in the 1950s. He later became as a local government leader near Xichang, the capital city of the Liangshan Yi Minority Autonomous Prefecture, but died in a car crash on 1986. Li Minfeng, another brother, was murdered by a Han government official during an argument in Hanyuan. The sixties brought collectivisation of agriculture and hard times for many of the residents. Zhaohoumiao today is part of Banyang Village, officially classified as a 'particularly poor' village. Many people still survive on per capita annual incomes of less than 850 Chinese Yuan. Conditions remain very hard for the residents of the hamlet, who rely on the sale of fruit and nuts, and on outside labouring jobs in local factories, mines or construction projects to supplement their subsistence agriculture. A recent local government project has improved the village drinking water system and the road running through the hamlet makes it much easier for the people to sell their produce and be available for labouring work. Families will send their children to school if they can afford to. Education is highly valued here despite the initial difficulties some Yi children experience learning in a second language. DORS have been assisting the people of Zhaohoumiao since February 1997, by paying the poorest families school fees and through setting up a Women's Rural Credit Scheme in May 1998. During meetings with the people of the hamlet they explained that they lack the capital necessary to invest in diversifying their household activities, for example developing agricultural sidelines, cash crops, or a small household enterprise. They have ideas for improvement but no access to the money needed to start or expand these ventures. The women's credit scheme, designed with the participation of the women themselves, provides them the opportunity to help themselves and their families. For more detailed information on the project see DORS Rural Credit Scheme and of life today in an Yi Village see Rose's research report from March 1997, where she stayed in Sugu Village. 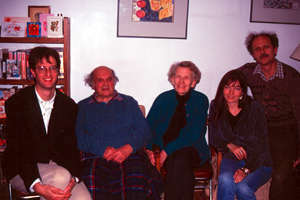 Rose and Richard visiting Isabel, her husband David and son Michael in Beijing in 1998. DORS would like to thank Isabel for sharing her fascinating experiences and photos with us and we would also be very interested in hearing from anybody else who has visited the area in years gone by.